Educating our clients is one way that Liner Legal makes the legal process less intimidating. We do believe that knowledge is power, and therefore, we want to share FAQs with you to explain the process and what you can expect along the way. Of course, we are always available to answer any questions you may have, so don’t hesitate to let us know how we can help with FAQs for disability cases in Ohio. What are Social Security Disability (SSD) benefit’s eligibility requirements? How is Social Security Disability (SSD) and Supplemental Security Income (SSI) different? While the medical requirement for both programs is the same, and both are managed by the Social Security Administration (SSA), these programs are different. The biggest difference in these programs is that SSD had an earnings requirement, which means you must pay into the insurance for 5 out of the 10 years before your injury. SSI does not have this requirement and you are eligible based on your income and financial resources. To qualify for SSI, your resources cannot exceed $2,000 (individual) or $3,000 (married). What qualifies as a “resource” for SSI benefits? Your SSI eligibility is based on “countable resources.” A countable resource is anything you can convert to cash, including cash, stocks, bonds, savings accounts, real estate, and so forth. If you live in your home, the value of that home does not go toward countable resources. Also, any private assets with a value of $1,500 or less do not qualify. An attorney from Liner Legal can help you determine which resources qualify under the countable resource rule, and which you might exclude. When should I submit my application for SSI or SSD? When you have been given a prognosis of a disability that will keep you from work for one year, you should start your application process. If you have been struggling to work with a disability, you should apply as soon as you stop working. To streamline the process, gather all medical records and supporting documentation so that you can submit your application and have it processed quickly – which will reduce the financial impact the application process has on your lifestyle. Also, write down a list of any jobs you have held over the past 15 years so that the SSA can verify your eligibility. Can I receive retroactive disability benefits from the SSA? Yes. SSA offers backpay, known as a retroactive benefit check. This is a one-time payment you receive after your disability approval, and it pays for the time from your application to the start of your benefits. You can receive up to one-year of retroactive pay, but only if you can prove you were disabled during that year before the application. You can receive the backpay check in the month after you apply for benefits for SSI. My SSD application was denied. When is the deadline for my appeal? You have 60 days to appeal your SSD denial. The team at Liner Legal, LLC can help you file an appeal and ensure it has the right evidence to increase your approval chances during the appeal. How many steps are there in the disability application process? First is the application stage. After that, you have 60 days to appeal from your first denial. You should receive the denial at your application. Next you enter the Reconsideration stage. From here you have 60 days to appeal again. The third stage is the most critical, because it is the hearing stage. During your hearing you meet with an Administrative Law Judge. If the judge denies your appeal, you have 60 days to file your final appeal with the Appeals Council. If you lose at the appeal court phase, you still have the right to file an appeal in federal court. However, at this point it is unlikely you will succeed without an attorney’s assistance. How long does an initial decision take after I submit an application? Every state has their own SSA office responsible for handling these initial decisions on disability cases; therefore, the amount of time can vary. Here in Ohio, you can expect your initial decision to take 4 to 6 months. What is a “strong” case for disability benefits? To avoid the hassles of a denial, you want to present your strongest case from the initial application. This is done by presenting strong medical evidence, including your physician’s description of how your condition prevents you from working, your current limitations, and the prognosis. Having an attorney from Liner Legal, LLC collect and present the evidence is best. Does my age affect my disability benefits? Yes, age does affect benefit decisions. When you are older, you do not have the ability to learn a new skill set and less able to adjust to newer working conditions; therefore, you do not have the same employability as someone younger. Your claim is easier when you are over 50 years – and more so when you are over 55 years. At age 50, you must prove that you cannot do your past work or work in a position that requires more than sedentary activity. Once you reach 55 years, you must only prove you cannot perform light work, which means being unable to lift more than 10 to 20 pounds. What disabilities are easier to receive benefits for? Certain disabilities qualify easily for benefits compared to others. For example, if you are legally blind you are automatically deemed “disable;” therefore, your case would be simple. Also, certain illnesses can qualify you for disability benefits faster, like being diagnosed with Lou Gehrig’s Disease. Alternatively, if you have a psychiatric condition, it is more complicated to qualify for benefits, or if you have a condition like chronic fatigue. These conditions are difficult to prove, because they do not have blood tests or definitive laboratory results to establish the illness. Regardless, the team at Liner Legal, LLC will help you with whatever illness or injury you suffer. We know how the SSA scrutinizes, and we can aggressively fight for your right to benefits. After two denials I must request a hearing. How long does it take to get a hearing date? Unfortunately, it is rare to receive a hearing date under one year from the date you request one. In fact, Ohio’s latest numbers show that you may wait 17 to 18 months for a hearing. Can you expedite a hearing date? Yes, there are ways to expedite the process. In some instances, judges purposely weed out the cases they know they can grant quickly because the medical evidence is strong. At Liner Legal, LLC, our attorneys will write the judge and summarize the evidence in your case that proves your disability. This process is known as an on-the-record letter, and it might expedite the process. In some cases, the judge might agree and approve your benefit application without the hearing. Not all judges grant these letters; therefore, sometimes you must just wait for a hearing date. At what stage should I hire an attorney for my disability benefits? Technically, you can hire an attorney at any time. However, it may be in your best interest to hire an attorney during the early stages. Not all law firms in Ohio will work with you during that initial stage – and some will not represent your claim until you have had two denials. Liner Legal, LLC takes your case from the start, and we have taken our clients all the way to federal court. 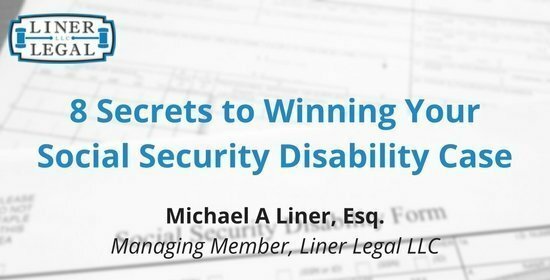 How do I pay for a social security disability attorney? When you hire Liner Legal, LLC, our fees are set by the statute, and you do not pay us unless we win your case. The fee comes as a direct payment and is a contingency of the past-due benefits. Fees are typically capped at a maximum of $6,000, but the cap is subject to change and is set by the Commissioner. Does an attorney increase my chances more than being unrepresented? In most cases, an attorney is much more beneficial than trying to get social security without one. The process is not easy, and you have deadlines, reports, and specific criteria you must follow at each stage of your case. You also need access to experts to increase your chances at a hearing, and without being trained in cross-examinations, you may not know what to ask experts that are trying to disprove your claim.